The airfield at Bardney was located ten miles to the east of Lincoln and four miles south of Wragby. 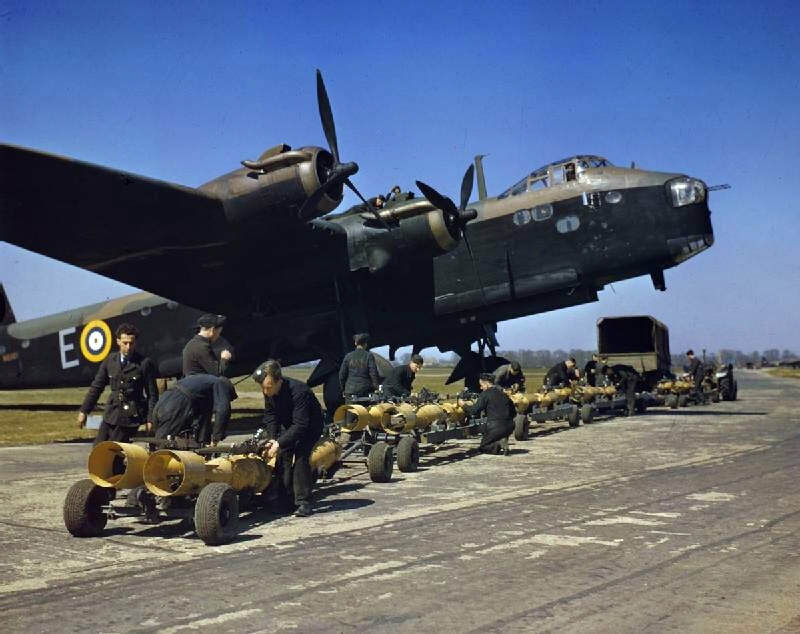 As the bombing campaign over occupied Europe developed and became more intense, Bomber Command required more airfields to sustain its ever strengthening power. 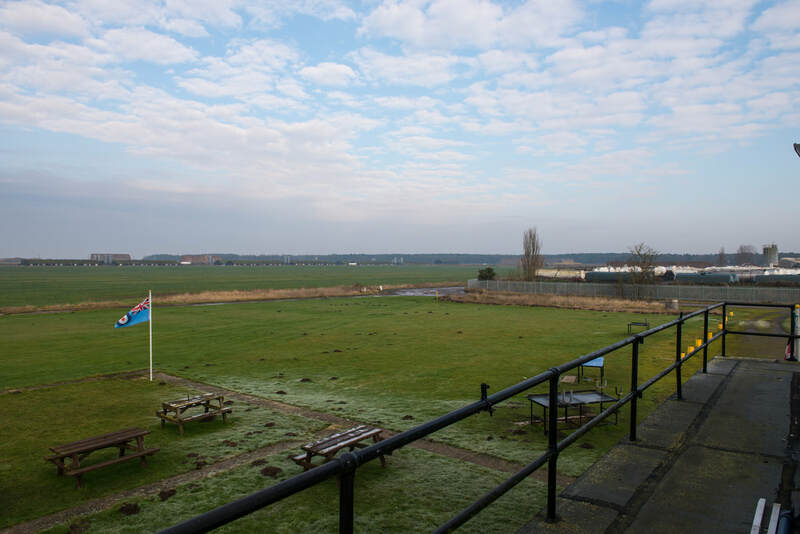 Bardney was first surveyed in 1941 and with the land being flat and workable, it was decided to construct an airfield as a satellite to nearby RAF Waddington under the control of 5 Group. In 1942 construction commenced of a Class A airfield at Bardney, with opening delayed until April 1943 due to a shortage of materials. Three runways were laid 07-25 at 2,000 yards, 02-20 and 12-30 at 1,400 yards. 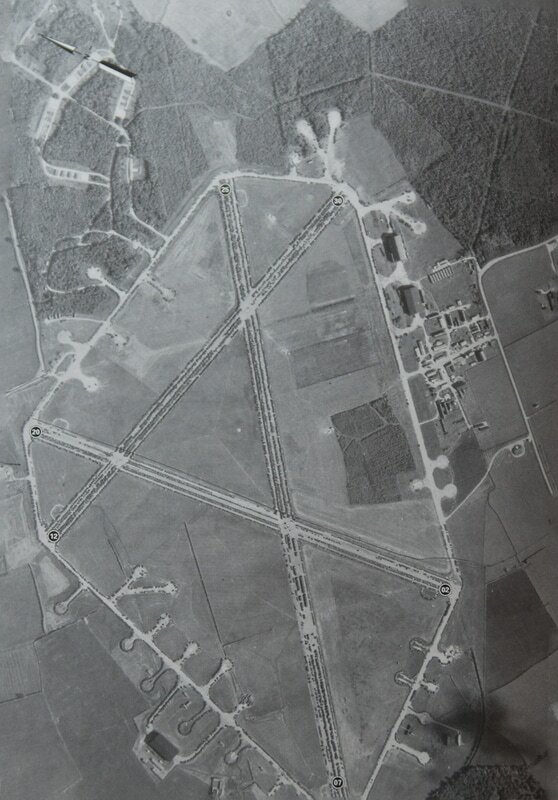 Originally 36 hardstandings were connected to the perimeter track with 1 being lost with the construction of a B.1 hangar at the head of runway 30. Two T.2 hangars were also erected with the bomb dump located to the north east side between runway heads 07 and 12. In April 1943 9 Squadron arrived at Bardney from RAF Waddington to begin the units association with the airfield that was to last until the end of hostilities. No 9 Squadron had long been at war by the time it arrived at Bardney. From the earliest days of the conflict the squadron had been in action and suffered some of the first losses of the war. Flying from RAF Honington on 4 September 1939, Vickers Wellington Is L4268 and L4275 were shot down whilst taking part in a raid on two German battleships anchored in Brunsbuttel, with the loss of ten crew members. In August 1942, 9 Squadron transferred to 5 Group and moved to Waddington where the unit converted onto the Avro Lancaster. Leaving Waddington on the evening of 13th April 1943 the Squadron took part in a raid on the port of La Spezia in Northern Italy. Returning to England on 14th April the squadron landed at Bardney to be greeted by their ground crews who had moved overnight from Waddington. In this instance all the aircrew that left Waddington for the raid on La Spezia landed safely back at Bardney. 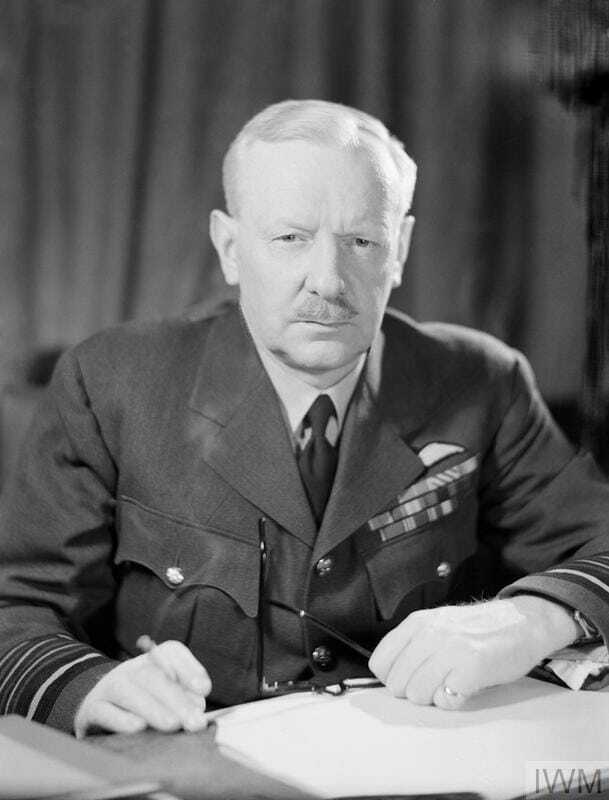 By March 1943 Bomber Command's Commander In Chief Sir Arthur Harris, had built up his forces to the extent that he felt the time was now right to launch sustained major attacks on German industry in the Ruhr Valley. 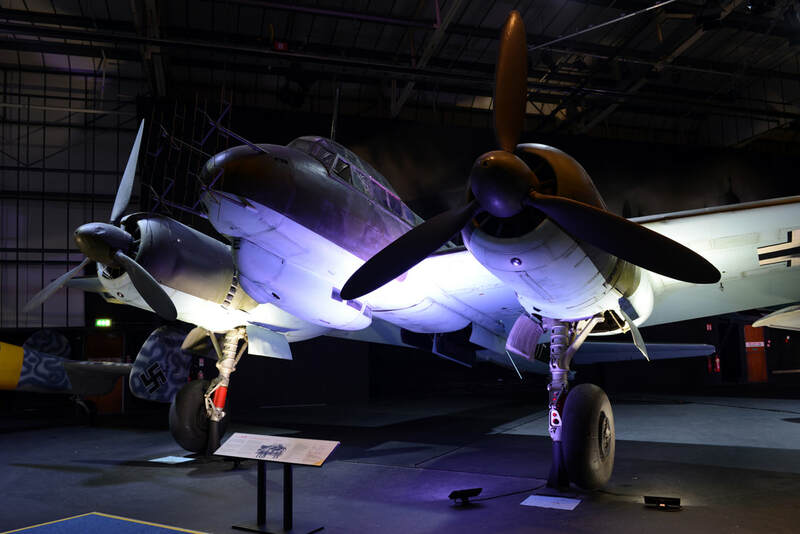 Bomber Command did not solely concentrate on the Ruhr during this time, to have done so would have given the the Luftwaffe's nightfighters, flak defences and searchlights the chance to concentrate their efforts on defeating the attacking bombers. Roughly two thirds of the Command's efforts were targeted on the Ruhr with the remainder scattered all over Europe which helped disperse the defences. 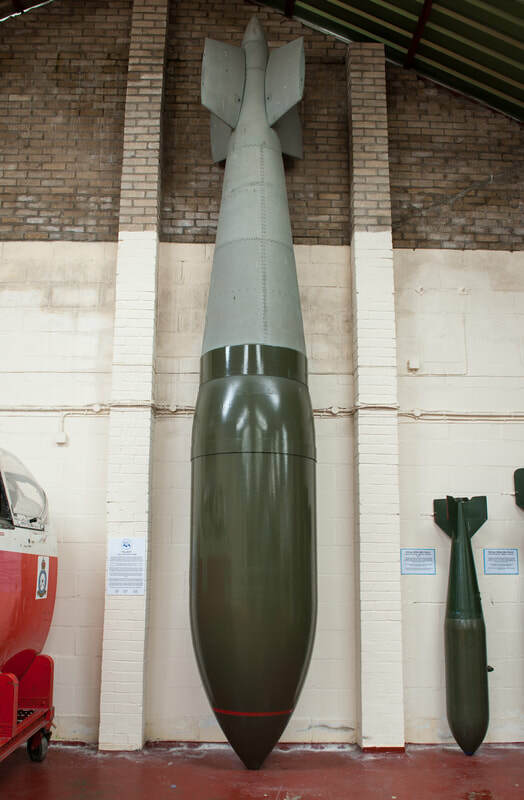 The Ruhr was also in range of Mosquitos that carried the blind bombing device known as Oboe. This electronic aid gave a better target marking accuracy and made the Command's raids more effective and efficient. The first operational loss by 9 Squadron flying from Bardney occurred on 30 April - 1 May 1943. Lancaster III ED838 WS-R was tasked to take part in a raid on Essen. The aircraft piloted by F/O Nunez, who came from St Joseph Trinidad, was lost without trace with the crew commemorated on the Runnymede Memorial. The photo on the left has been obtained from the Imperial War Museum and shows a crew and Lancaster involved in the Battle Of The Ruhr whilst flying with 9 Squadron from Bardney. In the photo the crew of Lancaster III ED831 WS-H are seen boarding their aircraft on 20 June 1943 for an operation to the Zeppelin Works at Friedrichshafen. 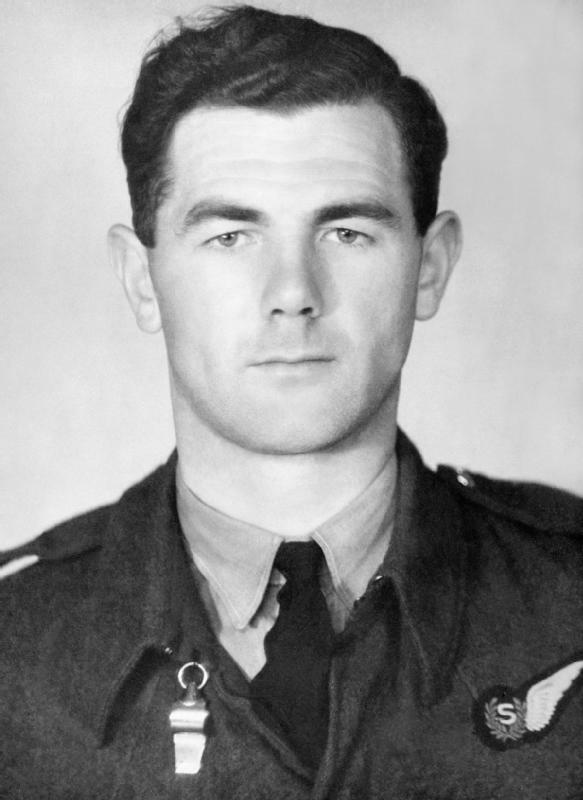 The bomber is captained by Squadron Leader A M Hobbs DFC RNZAF and was one of 60 Lancasters that were to take part in the raid. The Zeppelin works made Wurzburg radars an integral link in the Luftwaffe's control of nighfighters, which were causing continuing losses to Bomber Command. The raid itself was one of the first to use what was to become known as the Master Bomber technique. This was where the raid was controlled by the pilot of a one of the Lancasters, in this instance from 97 Squadron. The Master Bomber acted as Pathfinder and dropped target markers at which the first bombs were aimed. The attack then proceeded with a time and distance run commenced on the shores of lake Constance to the estimated position of the works. 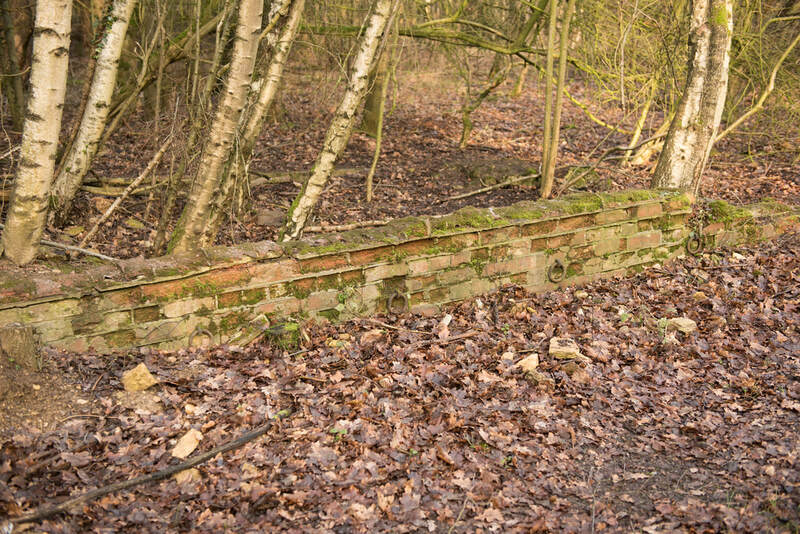 Post raid reconnaissance showed that ten per cent of the bombs hit the factory with substantial damage caused. The raid was also the first of what was known as a "Shuttle Raid" where instead of returning to their home bases the bombers flew onto and landed at Blida in North Africa. This caused confusion to the Luftwaffe's nightfighters who were waiting for the bombers return over France. On this raid no aircraft were lost and all reached North Africa safely. ​The photo on the right shows Lancaster III ED831 departing Bardney for the raid on Friedrichshafen. Raiding Spezia in Italy on the return journey from North Africa, ED831 arrived back at its home airfield on 24 June 1943. Over the night of 24/25 June 1943 Lancaster III ED831 took part in an operation to Elberfeld this time flown by Sgt G E Hall. Arriving back at Bardney at 04.20 hrs the aircraft was rostered for a further operation to Gelsenkirchen over the night of 25/26 June. Taking off at 22.30 hrs ED831 was again piloted by Squadron Leader A M Hobbs but this time with an eighth crew member. F/O John Hamilton Sams had been posted to Bardney from 1660 Heavy Conversion Unit on the same day as the operation to Gelsenkirchen. He was flying as "Second Dickie" to gain experience on an operational sortie with the crew of ED831. Bardney's Operational Record Book shows ED831 as aircraft missing, no signals received. Thirty aircraft were lost on this raid to nightfighters including 13 Lancasters, ED831 being one of them, with none of the crew surviving. F/O Sams, a graduate from Oxford University, would have gone through a rigorous selection process where only the best would succeed. He would have likely flown Tiger Moths in the UK, progressed to more advanced types such as the Boeing Stearman in the USA or maybe Cornells & Ansons in Canada where he would have gained his wings. He would have returned to England to learn how to fly and convert to four engine heavy bombers. Once this was completed successfully he would have been posted to an operational squadron in this case, 9 at Bardney. To give him an idea of what to expect from operational flying, he would fly with an experienced crew over Germany on the night of 25/26 June 1943. Second Dickies were not always welcome as many bombers were lost whilst they were on board and they were considered a jinx, superstition being high in the minds of alot of bomber crew members. All the same to go through all the selection, training and the human emotions that would have gone with it; to be lost as a Second Dickie is a tragic waste of a young life. The Battle of the Ruhr concluded on 24 July 1943 but there was no respite for the crews of Bomber Command or 9 Squadron as Harris launched Operation Gomorrah the code name given to the bombing of Hamburg, Europe's largest port and Germany's second largest city, which opened on 24/25 July 1943. ​The attack on the city began using Pathfinder and Main Force squadrons, also for the first time, "Window" was employed to jam Luftwaffe radars. It proved a success with 12 bombers failing to return out of a force of 791 that took part in the raid, a loss rate of 1.5%. This was the opening of Operation Crossbow, the Allies strategic bombing campaign against the Nazi V weapon programme. 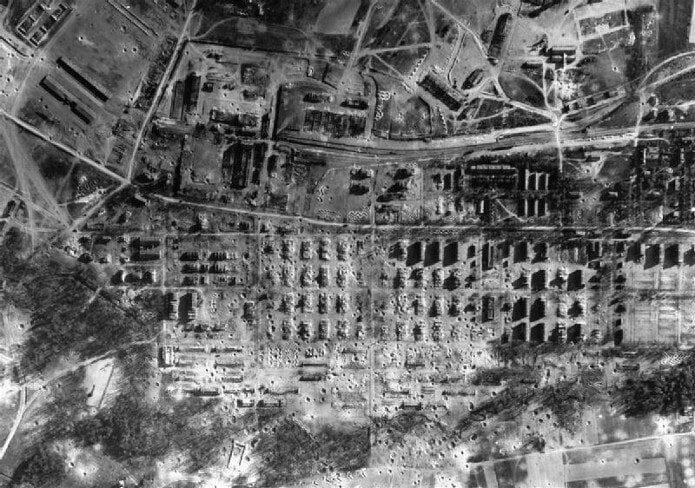 The raid on Peenemunde resulted in a seven week delay in V weapon production, but came at a loss of 40 Bomber Command aircraft, 215 crew and many foreign workers in a near-by concentration camp. Crews from 9 Squadron took part in the raid with all aircraft returning safely. As the Summer turned to Autumn in 1943 the war for the Axis powers was not going well. Italy were near to surrendering, the Battle Of The Atlantic was turning against the U-Boats and the Russians had won a decisive victory at Kursk. At the tail end of August Harris decided to again mount raids against Berlin, as the nights were drawing in and the cover of darkness was needed to attack this most well defended of cities. On 23/24 August a raid to Berlin was undertaken with all 9 Squadron Lancasters returning safely, the squadron been lucky as a total of 56 bombers were lost on this night with the Halifax and Stirling squadrons being particularly hard hit. A loss rate of 7.9% made this the most costly raid for Bomber Command so far in the war, although worst was yet to come. The greatest test of the war for Bomber Command commenced on 18/19 November 1943 when an attack on the German capital Berlin was undertaken. Sir Arthur Harris had decided that Berlin should be reduced to a wasteland and in his mind its destruction would bring about the end of the war. For the next four and a half months Harris more or less had a free hand in pursuing his aim of bringing about Berlin's demise. Thirty two missions were launched during the period, 16 to Berlin and 16 to other large cities. Crews not only had to contend with poor winter weather and long flight distances, but also a reinvigorated Luftwaffe night fighter force, who had found ways of counteracting the advantages of Window and were taking an ever increasing toll of the Command's aircraft. ​From a technical perspective new models of the navigation aid H2S were being fitted to Pathfinder aircraft, which was fortunate as the use of Oboe was out of the question due to the distance of the targets rendering it ineffective. In the period from August to the third week in November heavy losses forced Harris to withdraw the Stirling from the main force, this entailed Bomber Command losing eleven squadrons of aircraft, something that could be ill afforded at this time. Harris's aim of destroying the German capital was becoming somewhat more difficult. With the withdrawal of the Stirlings losses among Halifax II & Vs began to rise, this entailed a further number of squadrons being retired from the main force. ​Harris's force had lost approximately 250 aircraft and nigh on 20% of his bomb carrying capacity due the removal of the Stirling and the reduction of Halifax bombers from the theatre of war. The withdrawal of the two aircraft types put additional strain on the remaining Lancaster squadrons, who stepped up to the mark to fill the void. ​The main offensive of the Battle Of Berlin ran from the 18/19 November to the end of January 1944, with the Command's effectiveness slowly deteriorating in the face of mounting losses and a decline in crew morale​. In February and March 1944 raids were made on lesser German cities with two more raids taking place to Berlin before the month's end. Harris's vision of destroying the capital city had not come to fruition, with the Germans no nearer surrendering than they were at the beginning of the bombing operations. The Battle Of Berlin raids ended on the night of 24/25 March 1944. There is no question that Bomber Command had just completed its toughest test yet to date with heavy losses in aircraft and crews. A game of cat and mouse had developed between the two sides with regards to each trying to get the technological advantage in night fighting techniques, countermeasures and tactics. The Main Force was sent on the eight hour round trip to Nuremberg on 30/31 March, despite reports that weather conditions were not favourable for the raid. In total 795 five aircraft were dispatched and in bright moonlight were met by the Luftwaffe's night fighters which on the flight to the target accounted for 82 of the Command's aircraft. Conditions on the night also led to contrails forming which made it all the easier for the night fighters to see and intercept their quarry. In total 94 aircraft were lost on the raid which was to be Bomber Command's biggest loss on one raid of the war. The first three months of 1944 had been a torrid time for Bomber Command with heavy losses among aircraft and crews, the sad outcome of this was there was little to show in the way of results for the effort expended. 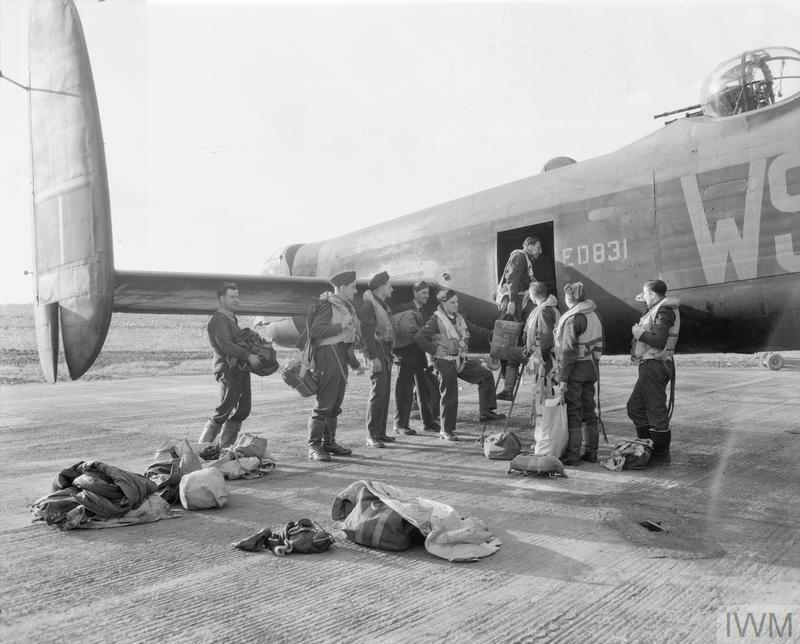 With D-Day in the planning stage it was on the 14 April that Bomber Command came under the control of Supreme Headquarters Allied Expeditionary Force (SHAEF), with bombing operations changing from strategic to tactical. Raids were switched to targets in Occupied Europe and the transportation system in Western Germany. Harris was not all pleased that the efforts of Bomber Command were being used in such a way, but he gave his full support to the Directive he had been given. He was however, allowed a bit of leeway as the Directive also stated "Bomber Command will continue to be employed in accordance with their main aim of disorganizing German industry". In the period from 1 April to 6 June 1944 Bomber Command undertook raids to targets throughout Occupied Europe, Germany as well as mine laying and operations in support of the Special Operations Executive (SOE). 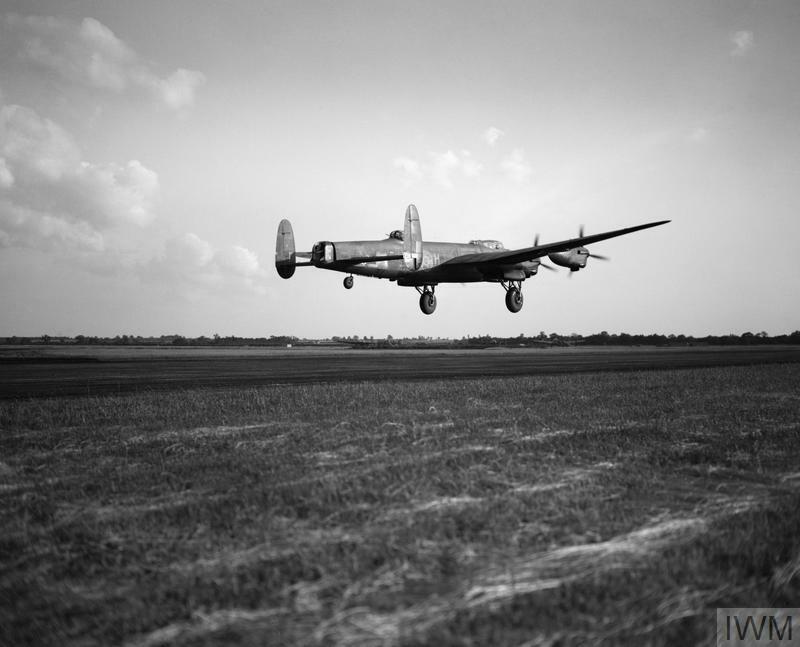 One raid on 3/4 May led to 42 Lancasters being lost including 1 that had flown from Bardney. The raid was to Mailly-Le-Camp in France where a German military camp was situated. A combination of delays caused by issues with radio communications resulted in bombers circling waiting for the order to attack. The delay allowed Luftwaffe night fighters to arrive and to wreak havoc amongst the bombers. The attack itself resulted in 1,500 tons of bombs falling on the camp which destroyed barrack buildings, transport sheds, ammunition stores, vehicles and tanks. D-Day went ahead on the 6 June 1944 and allowed the Allies to obtain a foothold in Europe, which was in due course to allow its liberation. Supporting operations were continued by Bomber Command which were prioritised as attacks on V-weapon sites, road and rail communications, fuel depots, troop and armour concentrations/ battlefield targets. The first week after the invasion saw Bomber Command fly 2,700 sorties at night in support of the landings. On 14 June the first daylight raid for over a year took place when elements of 1, 3, 5 & 8 Groups attacked German naval assets that were threatening Allied shipping off the Normandy beaches. The raid including participation from 617 Squadron who utilised 12,000-lb Tallboy bombs to attack concrete E-boat pens at Le Harve. Fighter cover from Spitfires of 11 Group helped to ensure only one Lancaster from 15 Squadron was lost during the raid. 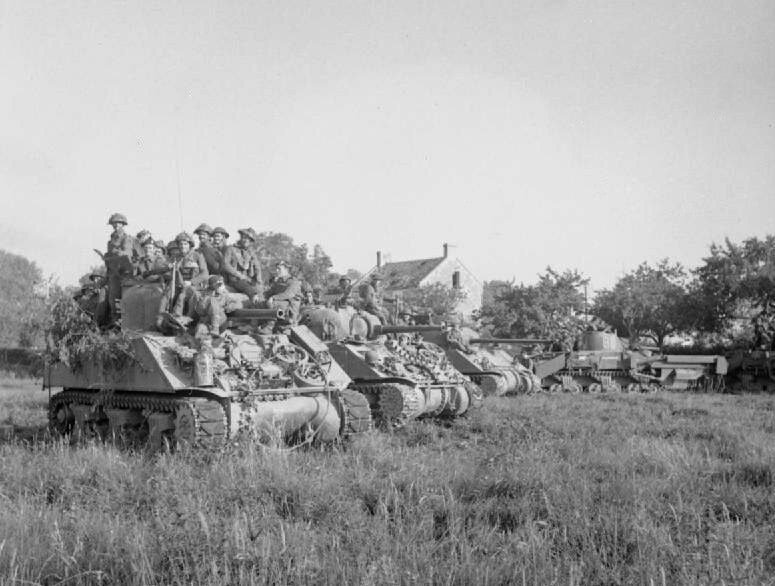 The British 2nd Army's breakout from the Normandy beach-head was code named Operation Goodwood and this commenced in July. ​Two major raids were undertaken on 7 & 18 July in support of Goodwood by Bomber Command to attack fortified villages in the Caen area. The raids resulted in the Germans being driven from the area but only after areas had been reduced to rubble. A force of nearly 700 bombers were tasked to the Normandy area to support American ground operations. During August further raids were undertaken in support of ground operations in the Normandy Battle Area, on the 7/8th 1,019 Lancasters, Halifaxes and Mosquitos attacked aiming points in front of Allied positions. A similar raid took place on 14 August but on this occasion bombs landed among Canadian troops killing 13 and injuring 53, this goes to show the difficulty of precision bombing with the tools then available to Bomber Command, who were more of a strategic rather than a tactical force. 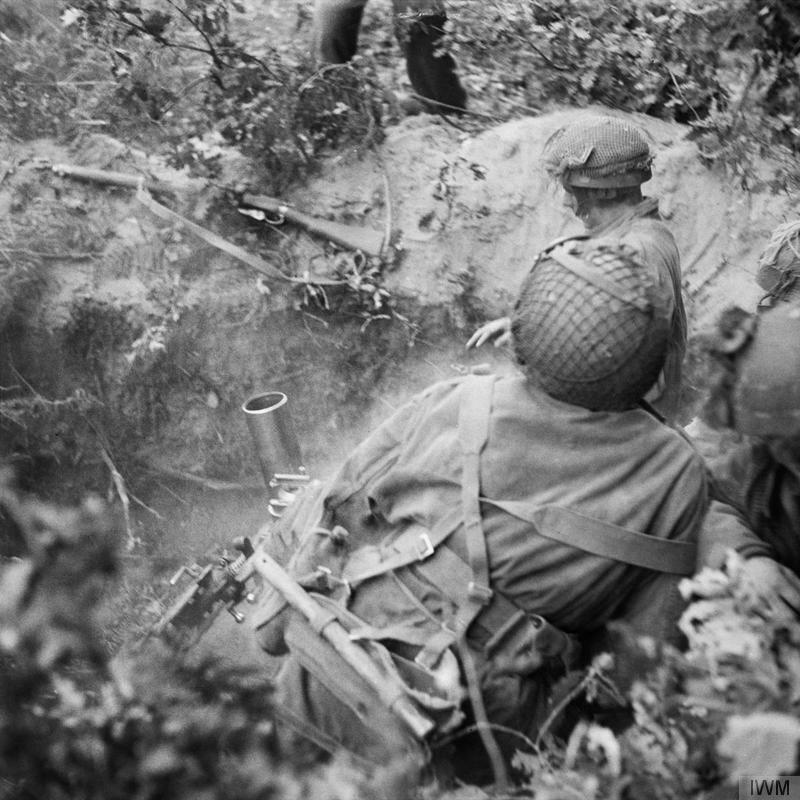 Quick progress was made by the Allies after they broke through the German defences in Normandy, Paris was liberated on 24 August and Belgium entered in September, which yielded the vital port of Antwerp shortly after. On 14 September Harris was released from his control by SHAEF and Bomber Command reverted back to the Air Ministry, with the caveat it was to remain ready to answer any calls for assistance from ground forces as they moved towards Germany. Harris had no problem with providing this kind of support and remained ready to respond as required, but this only committed a small part of his now considerable force; so what was the best way now to employ Bomber Command and make the best use of this valuable resource ? Three schools of thought were prevailing at the time which were, attacks on the synthetic oil production, the German transportation system and a less favoured option of a return to the strategic bombing of German industrial cities. A directive issued on 25 September to both Bomber Command and the American 8th Air Force made it clear that the oil option had won with a secondary option to attack the German rail, waterway transport system and also tank and vehicle production. Later in the directive it stated that when weather or tactical conditions precluded operations on the primary targets, German cities were cited for general attack. This gave Harris all he needed to continue his raids on the cities as he did not feel attacks on the oil industry were the best use of the force at his disposal; although many of the cities targeted were associated with oil production. During this time Bomber Command's strength continued to grow, bombing aids improved and electronic measures were further implemented to outwit the Germans, even cloud cover now failed to protect their cities. The Luftwaffe night fighter force was in decline and bomber casualties were reducing, the scene was set that was to led to the ultimate victory. Bomber Command ranged far and wide to targets that included Brunswick, Nuremberg, the Ruhr, Darmstadt, Bremerhaven, Bonn, Freiburg, Heilbronn and Ulm. Crews flew by day and night, their log books showing attacks on a variety of targets which encompassed gun batteries in France, the Dortmund Ems Canal, obscure German rail yards and even the Tirpitz which was ultimately sunk in a Norwegian Fjord. The extent of the raids can be seen in that 46% of the total tonnage of bombs dropped by the Command would be in last nine months of the war. 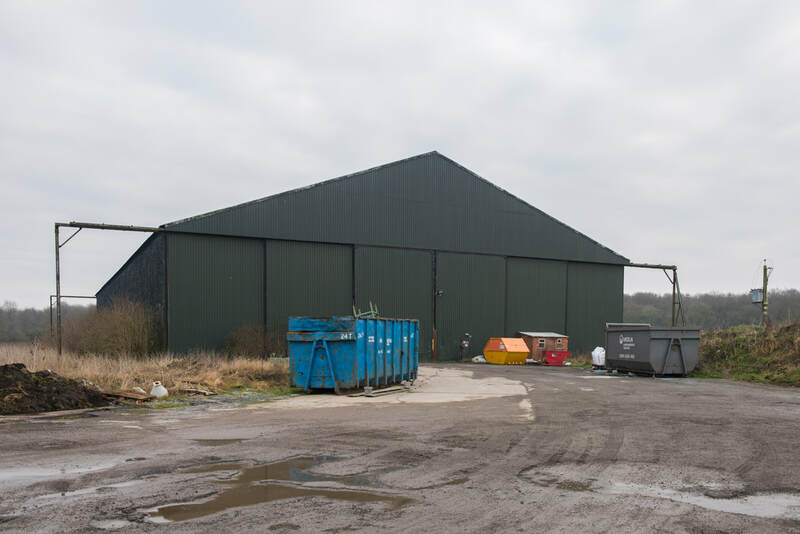 Since opening Bardney had been home to one squadron but this changed on 7 October 1944 when 227 Squadron partially reformed at the airfield from 9 Squadron's A Flight before moving out to RAF Balderton a couple of weeks later. On 15 October 1944, 189 Squadron formed at Bardney staying until 2 November before moving to RAF Fulbeck. Avro Lancaster I W4964 left the A V Roe factory on 12 April 1943 and in due course was assigned to 9 Squadron at RAF Bardney. The average survival expectancy of a Lancaster in service was three weeks but some lasted alot longer, W4964 was one such aircraft. 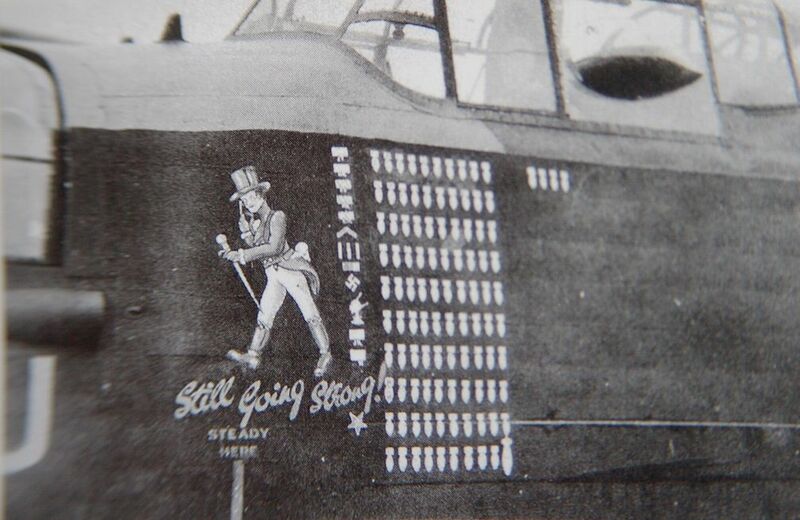 Following arrival at Bardney W4964 was given the squadron code WS-J (J-Johnny) this led to nose art being applied between the pilot's port side window and the front gun turret, which depicted the Johnny Walker whiskey symbol and the motto "Still Going Strong". 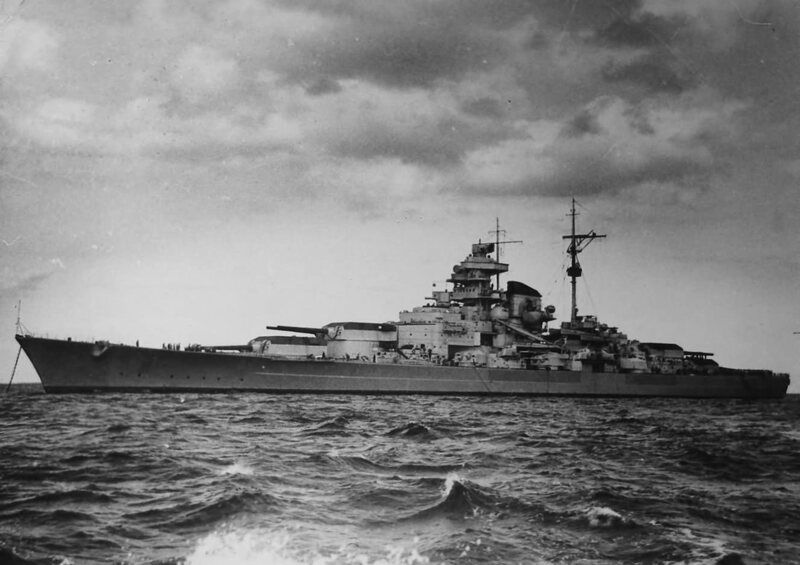 The Tirpitz had long been a thorn in side of the British, even with the ship holed up in Norway and not at sea, it was still seen as a threat that needed to be eliminated. There was concern the ship was about to leave Kafjord and therefore pose a risk to the Royal Navy's Arctic convoys that were supplying the Russians. Operations were planned that would see 9 & 617 Squadrons attack the Tirpitz with Tallboys under the code name Paravane. The Lancaster did not have the range to reach the Tirpitz when carrying a Tallboy from Britain, this dictated the two squadrons would need to operate from an airfield closer to the battleship's lair. The Russians provided an airfield at Yagodnik near Archangel some 600 miles from the Tirpitz which entailed the planned raids were feasible. On 11 September 1944, 18 Lancasters from 9 Squadron led by WC James Bazin and 20 from 617 Squadron commanded by WC Willie Tait flying from RAF Woodhall Spa, flew to RAF Lossiemouth in Scotland before departing to Yagodnik. One Lancaster turned back over the North Sea with the remainder pressing on to be met with fog over their destination airfield, six aircraft crashed in Russia with all crews surviving. Of the 38 Lancasters that departed Lossiemouth, 27 and a camera ship were available to take part in the raid planned for 15 September. Twenty aircraft were loaded with Tallboys with the remainder carrying 500Ib Johnny Walker mines, a weapon designed to attack capital ships in shallow water. ​As the Lancasters ran into the attack a small amount of cloud drifted across the Fjord which together with the ship’s smoke screen prevented the crews observing the results of their bombing. One Tallboy had hit the battleship near the bow which caused considerable damage. The ships engines were also damaged either from the hit or near misses, the Germans decided it was not practical to make the Tirpitz fully seaworthy so moved her to an anchorage near Tromso, where she would act as a semi-static heavy artillery battery to protect northern flanks against a feared Allied invasion. The British were not aware that the Tirpitz was now not a threat to other shipping and planned further operations to put the ship out of commission. No Lancasters were lost during the first operation although one from 617 Squadron crashed in Norway whilst returning to Lossiemouth two days later. Moving the Tirpitz put her within range of Lancasters flying from Scotland. Operation Obviate took place on 29 October 1944 with 18 Lancasters each from 9 and 617 Squadrons together with an aircraft from a film unit. ​The Lancasters taking part in the raid had their mid-upper turret and other equipment removed to enable additional fuel to be carried to complete the 2,250 mile round trip. A third raid was planned to the Tirpitz named Operation Catechism and this took place on 12 November 1944. Thirty Lancasters from 9 and 617 Squadrons with a camera ship from 463 Squadron (RAAF), took off from Lossiemouth and flew to Tromso where they found the battleship in clear conditions. Tirpitz was hit by at least two Tallboys which caused a violent internal explosion, the ship capsized and was a total loss, approximately 1,000 of her 1,900 crew were killed. Nearby Luftwaffe fighters stationed to protect the ship did not take off in time which resulted in one 9 Lancaster being hit by flak and landing in Sweden, its crew unhurt. No 9 Squadron had become known as a specialist bombing unit within Bomber Command and were tasked on further occasions to use Tallboys, as and when the need arose. (50 & 61 Squadrons) joined RAF Waddington (463 & 467 Squadrons) in becoming 53 Base - Waddington. The War was drawing near to ending but Hitler still had some surprises up his sleeve. In December 1944 the Germans launched their last offensive in the west with an attack through the Ardennes, which caught the Allies completely off guard. ​The plan was to drive an attack through to the port of Antwerp thus cutting off the Allied supply route. 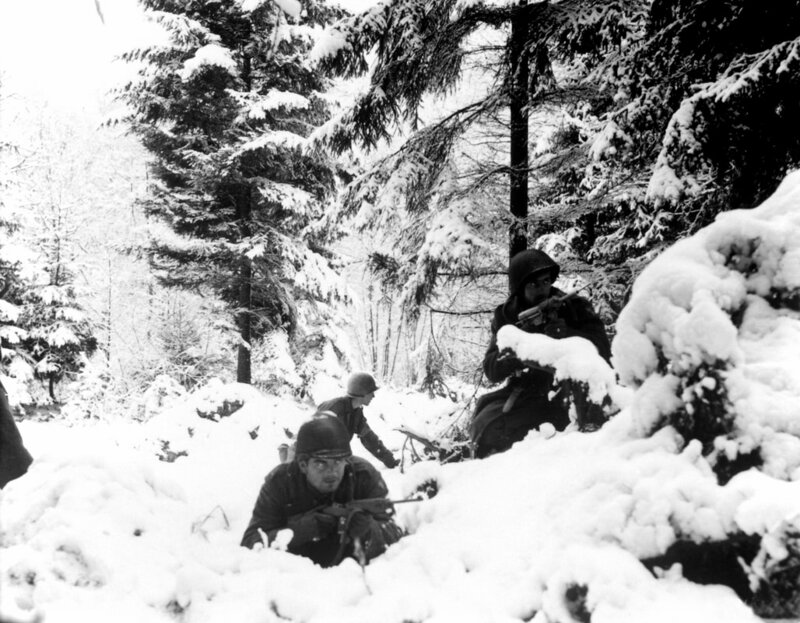 ​Bad weather hampered Allied air operations and in what was to become known as the Battle Of The Bulge, initial advances were made, but the Allies prevailed and pushed the offensive back. As the end of the year approached, most of Germany's major cities lay in ruins, the Ruhr continued to be attacked, the Allies and the Russians were advancing, however, Hitler and his henchmen showed no signs of surrendering, despite the suffering of the German people. The last major attack by the Luftwaffe took place on 1st January 1945 and was in support of the Battle Of The Bulge. Operation Bodenplatt was planned to catch the Allies aircraft off guard and so gain air superiority to allow the stalled advance of the German Army and Waffen SS on the battlefield to continue. Thompson received severe burns to his hands, legs and face, but he noticed rear gunner Sgt Haydn Price was also trapped in his turret. Once again and despite his own severe injuries Thompson went to the rescue of Price and brought him to safety. The gunner's clothing was on fire and Thompson again used his bare hands to extinguish the flames. Exhausted and in great pain Thompson reported to Denton to appraise him of the situation, so burned was he Denton didn't recognise him. Denton with the help of Goebel and flight engineer, Wilf Hartshorn flew the Lancaster back to friendly lines and crash landed near a Dutch village. On 23 January 1945 Thompson succumbed to his injuries as did Ernie Potts, who Thompson had fought so gallantly to save, Haydn Price survived. In recognition of this selfless act of bravery an announcement came on 20 February 1945 that Thompson would be awarded the Victoria Cross. ​Harris now had a strength of over 1,400 aircraft which at its peak would reach 1,625 bombers, most of them Lancasters. Losses continued to fall due to the overwhelming air superiority held by Allied air power. Over the coming months Bomber Command in conjunction with the American 8th Air Force systematically reduced Germany's capacity to fight by pounding them by day and night. Precision attacks on bridges and viaducts by 9 & 617 Squadrons utilised Bomber Command's latest weapon known as the Grand Slam, which weighed in at 22,000-lb and required specially modified Lancasters, flown by 617 Squadron, to carry the ordnance. Main Force raids continued against rail centres, marshalling yards, canals and aqueducts, while Fighter Command and fighters of the American 8th Air Force shot up anything that moved on the ground or didn't move for that matter. In February Bomber Command was ordered to take part in Operation Thunderclap. A series of raids on major communication centres immediately behind the Eastern Front were planned, which were packed with refugees fleeing from the Russians and with wounded troops. It was envisaged such raids would produce transport and communication problems on a massive scale and so aid the advance of the Russians westward; with a view that it would hasten the war's end. Stalin was putting pressure on Churchill to assist the Russian forces advance and the British Prime Minister was keen to use Allied heavy bombers to achieve this end. Opposition from his own ministers failed to deter Churchill who ordered plans to be drawn up to attack Berlin, Chemnitz, Dresden and Leipzig. On 3 February the USAAF bombed Berlin and on 13/14 February Bomber Command raided Dresden in what was to become one of the most controversial attacks of the war, which still causes argument to this day. Dresden was raided in two waves the second of which caused a firestorm that consumed an estimated 25,000 people. It is considered that this raid unfairly turned opinion against Bomber Command, Harris and his crews. No medal was struck for the Command at the war's end, which caused resentment from the crews for many years until this was addressed, partially, by the awarding in 2013 of a Bomber Command clasp. The clasp was seen by many veterans as an insult for their sacrifices and many never claimed the award. Harris was following the orders he'd been given but when the chips were down and he needed the support of Churchill, this was denied and can be seen very much as a betrayal and the scapegoating of Bomber Command's Commander In Chief and his brave crews; a very sorry episode indeed. Further raids were carried in February leading into March and it was on 16/17 during a raid to Nuremberg that the Luftwaffe night fighters still showed they could exact a heavy toll. During this raid 24 Lancasters were brought down, fortunately for 9 Squadron they attacked Wurzburg on this night without loss. Even at this late stage of the war, misery and loss came to haunt the Lincolnshire's airfields at a time when most crews considered they might just survive. At this point of the war there was not much of a threat expected from the Luftwaffe especially over England. This idea was however dispelled on the 3/4 March 1945 when intruders (Luftwaffe night-fighters) were in action over England as part of Operation Gisela. ​In total 23 bombers and 1 Mosquito were brought down by the intruders with a further 20 aircraft damaged. The Luftwaffe didn't have it all their own way with 8 night-fighters failing to return. Raids in March continued to a variety of targets which included shipyards, U-boat pens, railway yards, bridges and to the few remaining oil plants. The last loss for No 9 Squadron occurred on the 8/9th April 1945. A raid was undertaken to an oil refinery in Lutzkendorf during which Lancaster I NG235 WS-H was lost with all crew. Leaving RAF Fulbeck at 09.30 on 8 April 1945, 189 Squadron flew to Bardney to join No 9 for the last few weeks of the war. No 189 undertook their first operation from Bardney on 17/18 April 1945 to attack the railway yard at Pilsen with no losses. Nuisance raids by Mosquito aircraft continued on Berlin, with the last major raid by 512 heavies taking place on Potsdam on 14/15 April. Much of Germany had been overrun by this time but ports still needed to be captured. To facilitate this Bomber Command attacked the Island of Heligoland on 18 April, which guarded the approach to Hamburg and also the coastal batteries at Wangerooge which defended the ports of Bremen and Wilhelmshaven. No 9 Squadron flew their final mission on 25 April 1945 to Berchtesgaden, Hitler's Eagle's Nest and the local SS Guards barracks. ​No 189 flew their last operation of the war on 25/26 April and bombed the oil refinery at Tonsberg, with all aircraft returning safely, this was to be the last operation by Bomber Command heavy bombers in World War Two. Following this Bomber Command went onto more peaceful operations of repatriation of prisoners of war and the dropping of food supplies (Operation Manna) to starving Dutch civilians. The end of April 1945 saw some very significant events occurring. On the 12th President Roosevelt died to be succeeded by Harry Truman. The 28th saw Benito Mussolini killed by Italian partisans and two days later, Hitler with his long term partner and now wife Eva Braun, committed suicide in his bunker in Berlin. He was succeeded by Grand Admiral Karl Donitz. The very last operation flown by Bomber Command was on 2/3 May when Mosquitos of 8 Group and Halifaxes of 100 Group raided shipping at Keil, even at this late stage losses continued with one Mosquito and two Halifaxes failing to return. After just under six years the war was finally over for Bomber Command. 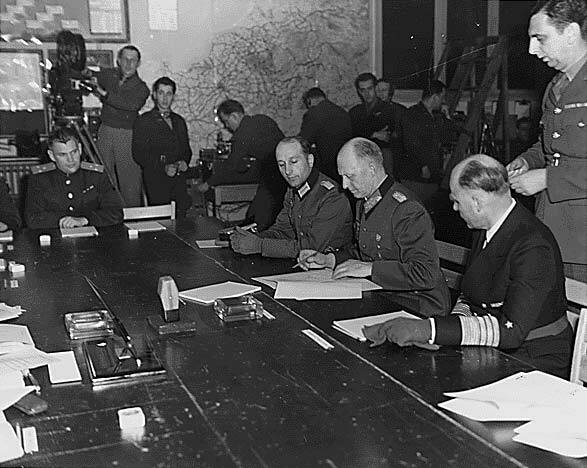 On 8 May 1945 the war in Europe ended with the signing of a document entitled the German Instrument Of Surrender. Its terms dictated the total unconditional surrender of Germany and the day itself became known as Victory In Europe Day (VE Day). RAF Bardney was just one airfield of the many that took part in Bomber Command's campaign over Europe. Nonetheless it would have experienced the whole range of human emotions; fear, sorrow, anger, despair, hope, joy and sadness that goes with groups of people who did not know if they or their loved ones would live to see another day. The European War was over, attention now turned to Japan and the Far East. On 21 June 1945, 9 Squadron's Operational Record Book states a Tiger Force training syllabus had been implemented. Tiger Force would have been the RAF's contribution to the continuing bombing offensive against Japan had the atomic bomb not brought hostilities to an end in August 1945. 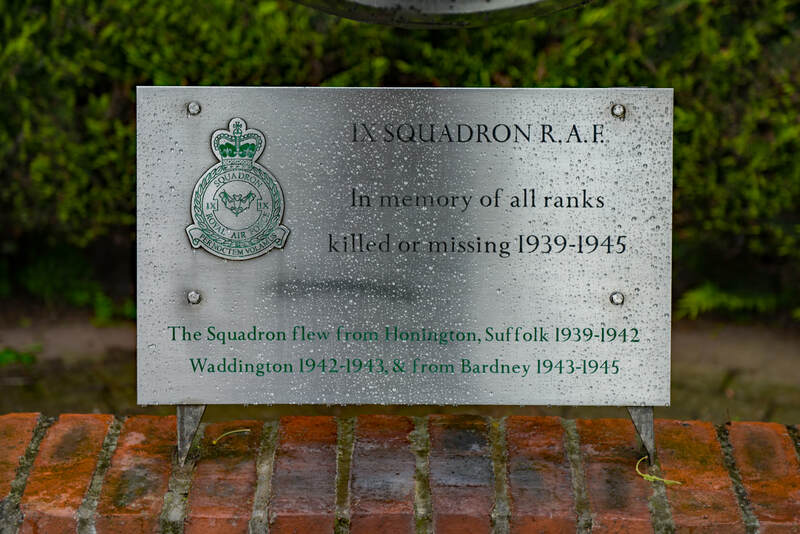 No 9 Squadrons long association with Bardney ended on 6 July 1945 when the squadron moved to RAF Waddington. No 189 Squadron left on 15 October and relocated to RAF Metheringham where they disbanded on 25 November 1945. Following the departure of 189 Squadron, Bardney closed to flying but was retained for use by the Army who used the runways to store vehicles. 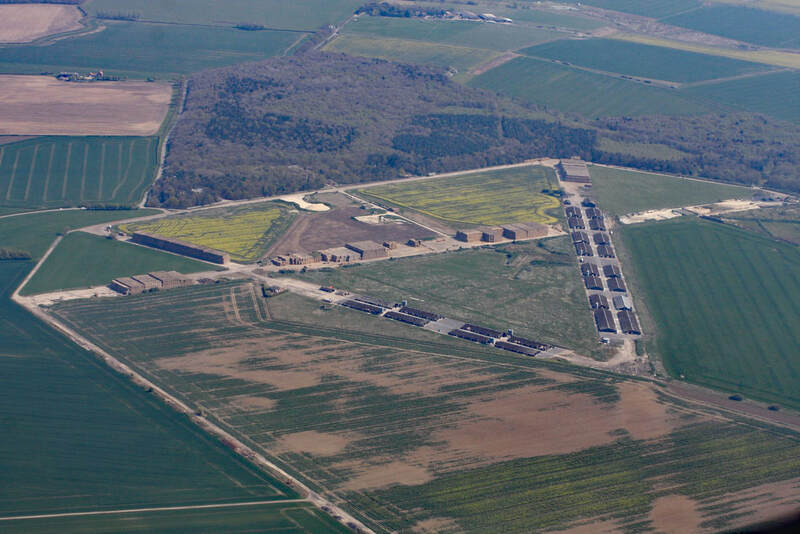 Between 1959 and 1963 Bardney became a Thor Intercontinental Missile site, after which the airfield was once again closed and over the years has reverted back to agriculture. 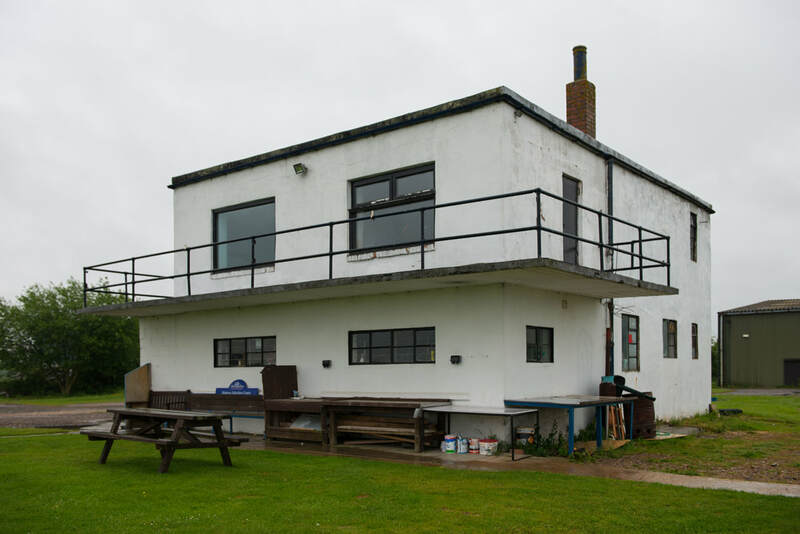 Today a number of buildings including the Watch Office remain with model aircraft flying regularly taking place. 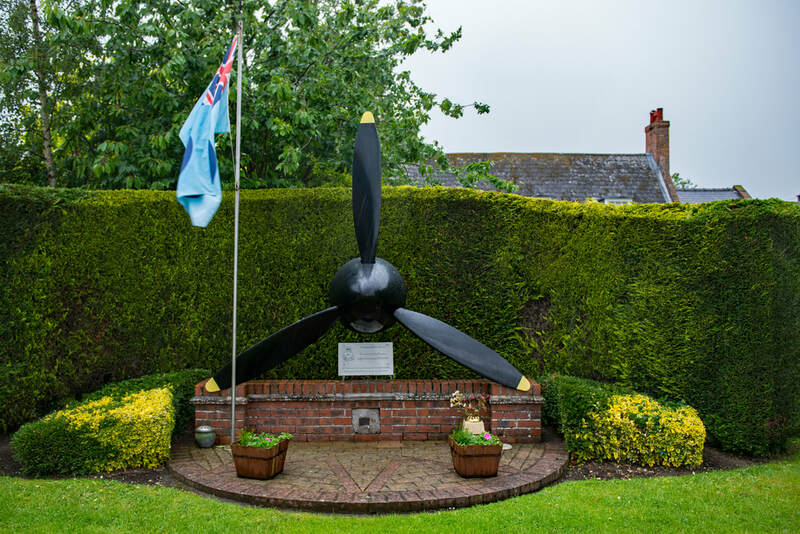 Within the village a memorial to 9 Squadron has been erected which features a three bladed propellor mounted on stone, which came from Kafjord in Norway.